The weathers gotten colder, the cosy clothes have crept their way to the front of your cupboard again and everything get’s darker way earlier. What I love best about Winter though are the dark colours that come out and are more acceptable to wear. Today I’m going to show you four Winter lipsticks that I love to wear around this time of year (and all year to be honest…). This post is actually in collaboration with the lovely Morgie, where you can find all her winter lipsticks and swatches here! I want them all. Since moving out for University, I only actually took my main lipsticks I wear to halls with me, and left behind quite a lot and I haven’t purchased any new ones in a while. I’m hoping to this soon! 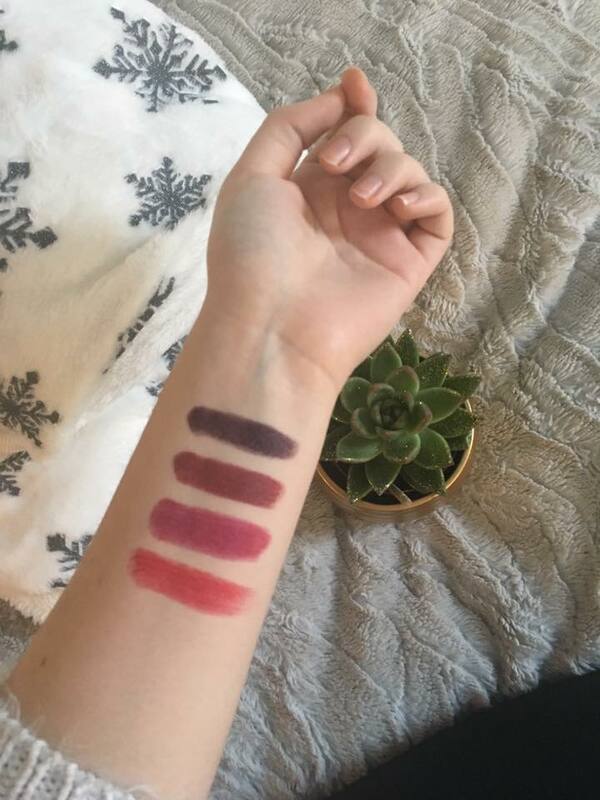 I have some swatches and pictures of the colours on. I’ll just go straight ahead and show you’s! I used to have Viva Glam II but I lost that and I was so heartbroken because it was a matte red. When I tried to re-purchase, the MAC I was in didn’t have it. So I got Ruby Woo instead as it was another matte red, and I love it. I also got the lipliner with it because it was such a bold colour. This is such a festive lipstick to add a pop of colour to any outfit. It wasn’t until writing this blog post that I noticed how close these two colours were. There is a slight difference, and I know this sounds silly – but it sometimes looks different depending on what you’re wearing. Girls might understand that. But yes, I am one of those people who have like four lipsticks of basically the same shade because why not. This one is a bit of a nicer consistency however, and easier to apply. By this point, my lips were well and truly stained from applying so many colours and taking them off. This is probably the boldest colour I have, and only really ever comes out in Winter. This makes any outfit look more edgy and I love wearing it with dark colours when I’m going out. My only fault with this one is that when it starts to come off, it’s a lot more noticeable just because it’s a bold colour – so I end up with like, purple on the outside of my lips and nothing on the inside after eating and drinking haha! And thats all my winter lipsticks done! I hope you enjoyed this post, and make sure you check out Morgies blog too! She’s currently doing Blogmas and I fully praise her for that because that is hella hard to keep up with. I know I couldn’t! Next Post Christmas Jumper Must Haves!